Coming up in just under 2 weeks is the Ocean Waves Quilt Guild Show – Birds, Blooms, and Butterflies! Beyond the 300+ works of art being showed (YES, quilts are works of art! ), Victoria Findlay Wolfe will present a Lecture and Trunk Show 4/26/19 ( Friday’s admission fee includes entrance to the Quilt Show and Victoria Findlay Wolfe’s lecture and trunk show starting at 5:15 PM) Victoria has a shop in NYC. She is an artist with several books, most recent is her book “Playing with Purpose: A Quilt Retrospective”. I can’t wait to see her trunk show and lecture on Friday! Check out her website –https://vfwquilts.com/ . Electrified Wine and Liquor Bottles decorated with paint. Check out their Facebook page. Thoughtfully designed handbags. Our bags are fun and easy to sew, and beautiful to carry! A craft business making beautiful hand knit scarves and handmade yarn necklaces. Cork fabric is a renewable, sustainable, vegan, alternative to leather great for bags, purses& jewelry. Quilts of all sizes, wall hangings, embroidered tea towels, and some stained glass pieces. Studio 180 rulers, patterns, and Deb Tucker tools to help make quilt piecing more precise. We make tools, equipment, workstations & machines for sewing, quilting, & embroidery. Handmade using a scroll saw (no lasers) & other tools, using patterns of my own and purchased. Ribbon necklaces and “mini infinity” circular scarves, goat milk soaps and homemade lotions. Featuring feed sacks whole, pieces & items made from them + Vintage quilts top, quilts & pincushions. 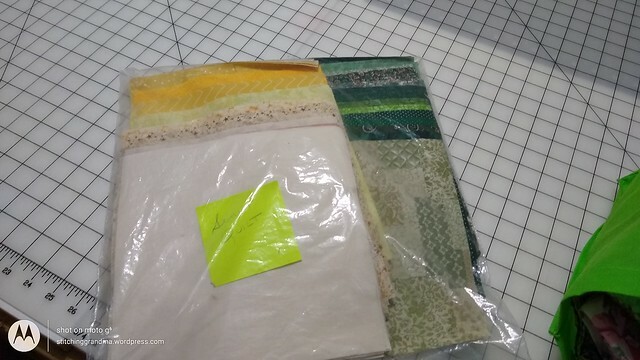 Fun Fabrics and Funky Finds! Designer fabric, notions, patterns, and books. We also have a line of our very own patterns. Crafting with wood or fabrics or textiles for many years + hand-dyed and mill-dyed wool. Paper or buttons, origami framed art that is created with Japanese seashells and mosaic glass. Landscape Art Quilt Kits, Beach bags, NFL Bags, Purses. Annapolis’ premier quilt shop with more than 6,000 bolts fabric + BERNINA & Handi Quilter dealer. Boutique shopping, organic cotton fabrics, hand-made fair trade yarns, modern embroidery kits. Fine modern fabrics, quilting supplies, and sewing notions. Paper, Cloth, Metal. Fab items for Fabric Lovers. Featuring Victoria Findlay Wolfe products (fabric collections, books, and patterns). Wood inlay designs, wall hangings, clocks, mirrors, pins, earrings, and wood turned sewing tools. Oh, yes….don’t forget.…I will have the OWQG booth – Second Time Around – where I will be selling BEAUTIFUL fabrics for $3/yard; and fat quarters for $1, and scraps (Fill a gallon bag) and buttons and ties and more…. Last week my friend Nancy B. came over and lent her two good hands to my embroidery project. 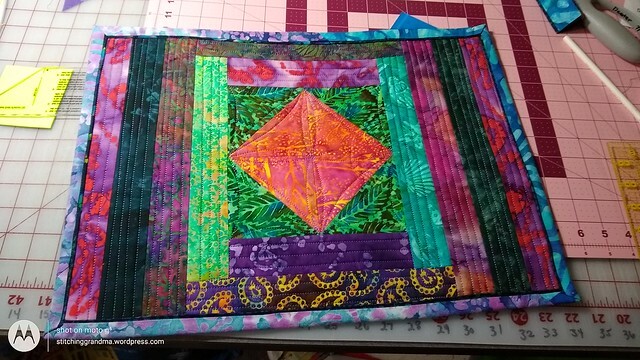 She got my fabric and stabilizer hooped for me and I was able to get busy and stitch out a verse on a quilt square. I wrote about the project in detail yesterday. I was so pleased that I was successful with that project I decided to try on my own and finally get a couple of tank tops done. Anyone who has spent time in my sewing room has seen them just hanging out on a hook for almost a year, waiting. Of course the first thing I did was ponder what to stitch. Then the choice of threads has to be considered. I consulted with the hubby on the first shirt. I had a varigated thread in mind and he recommended to wait until after the first part stitched before choosing the second color. It was good advice. What shows as background in teal is where I chose to use the varigated. The design is called Another swirly shell from OhMyCS.com. As a 4×4 design it did well. I choose a medium brown for the shell to ensure adequate contrast. Made that $5 tank top look quite beachy. The variety of colors don’t lock me into specific colors to wear with this top. When I got the next tank off the hangar I decided that the color of the shirt called for something pretty specific. This design, Floral Anchor with a rope, by Oh My CS.com is an applique embroidery project. Again I did a 4×4. And it was just shy of 10,000 stitches. It was much more work but the results pleased me. Both shirt photos were taken right away. I have washed each shirt and am satisfied with the results. They could each use a touch with the steam iron before I pack them in my suitcase this week. I like working on inexpensive t-shirts and tanks when I am practicing with the embroidery machine. I used my new thread stand during the stitching of these 2 shirts. My Queen Bee friend Marta gifted me a stand her husband had made. It really worked like a champ . I guess I should take a better photo, but I forget before I started this post. I spent some time on Friday with buttons. One tin of donated buttons really needed some work. They felt grimey when I handled them. I brought the tin in from the sewing room and got out my salad spinner. A little Dawn dish soap and water and 6 loads of buttons later, they were clean and pretty again. Note.. some buttons escape the confines of the salad spinner and it helps to have a strainer in the drain if the sink. I set them out on cookie sheets covered with dish towels to dry and pick through. I’m glad I did because there were all kinds of stuff in the button tin besides buttons. I must have thrown away 10 thumb tacks and other weird implements I can’t even describe. Right away I could see that there were lots of matching buttons. This was just the beginning of the sorting and I knew I could make up some sets of six or eight matching buttons easily. Sorting feels like therapy. I like the texture and shapes. It was tons of fun until I got to the boring white brown and black buttons. Do you have a collection of buttons on hand? How are they stored? Do you ever use any of them? Slowly I am building up speed….like an old locomotive building up steam and chugging up the hill. The long finger on my right hand is still splinted. A visit to my surgeon is scheduled for the end of the week, and I know he will say “3 more weeks”. I did some sewing in the last 2 weeks. Senior Quilts is a project at my church where we make a quilt for each of our High School graduates. The idea is to wrap the graduate in love and send them ‘off to their future endeavors’ with a reminder that the church is a place they can call home, to return as often as they can, and that they are always wrapped in the love of the members and the love of Jesus, no matter where they go. At my February Queen Bees gathering I used the “design floor” and laid out blocks for a quilt. With the help of my friends Judy and Suzanne, a pleasing arrangement of the blocks came about. There is only one graduate at church this year. I coordinate the “Senior Quilts” project. 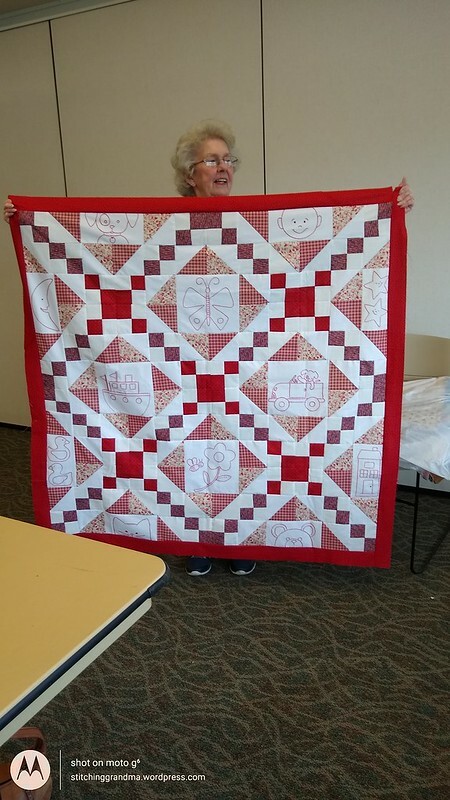 Judy is one of our member quilters, so I was happy to have her input. I figured I could assemble the top fairly quickly and used the “webbing method” to keep the blocks in order. (The are 8.5″ square). I got it assembled over the course of the following week, everything except the final row and the top right block. Those blocks get a photo and a bible verse. This Friday my friend Nancy B. came over and she “hooped” the block for me to embroider. I didn’t think I was up for hooping with my splinted finger. 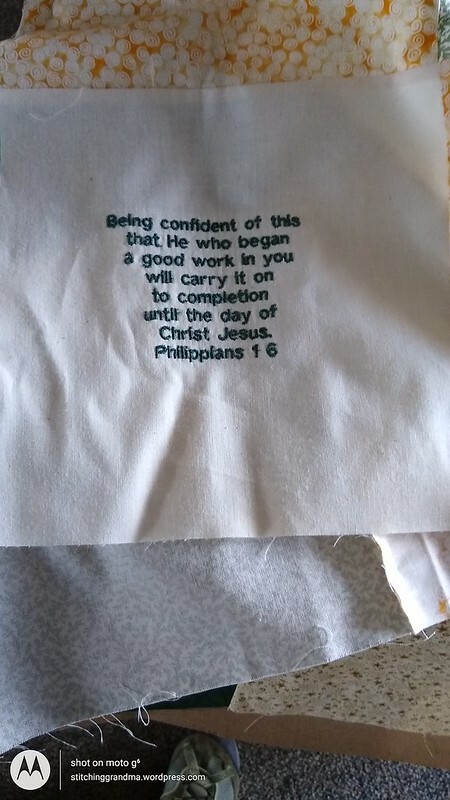 All went well and I managed to stitch out the verse. The verse was chosen by the mother of the graduate. The source (besides the bible) of the digitizing is Designs By JuJu. If you are looking for scripture to stitch out she has many available for FREE on her page. I give the parents each year the link to her embroidery designs and ask them to choose. This was done on a 4×4 hoop. It came out very clear for being so many lines in the small space. I oversize the piece of fabric then cut it to 8.5″ square after the stitching is finished. I use no-show fusible mesh on the back and float a piece of cutaway under the hoop. I also “print on fabric” a photo of the church. I use a product available at JoAnn’s — with great success. I have the photo set up to print 2 per page, then I trim and stitch to a plain muslin block. It helps to have a piece of stabilizer behind the block when stitching on the muslin this close. I used a blanket stitch and put a piece of cutaway behind it. The cutaway is very soft and will remain in the quilt. When printing on fabric I made certain that all the settings were at their highest quality. I also heat-set the photo with the iron from the top (with a pressing cloth) and from the backside. 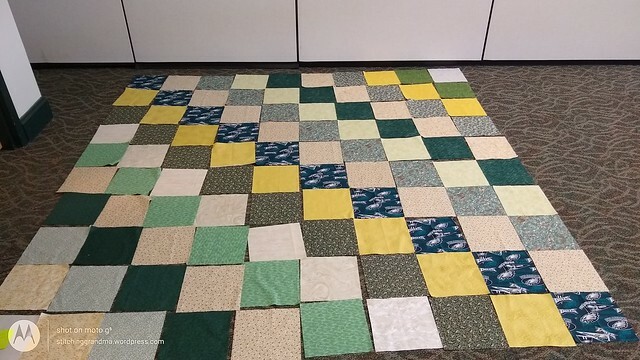 The last blocks were added to the quilt and I gave it a good press and delivered yesterday to the church. I realized that I hadn’t taken a photo of the finished top, so quickly used the “design floor” again and threw it down for a photo. It isn’t the best picture because I was in a hurry and didn’t smooth it out. The color green was a suggestion by the grad’s mom and she mentioned he was an “EAGLES” fan. Finding fabrics for young men can be a challenge. I have 3 containers of “church fabric” mostly donated by a church member. I was able to come up with some great prints that were “not florals”. I got in my bin and dug out one fabric that I thought was appropriate too. All in all it came together quickly. 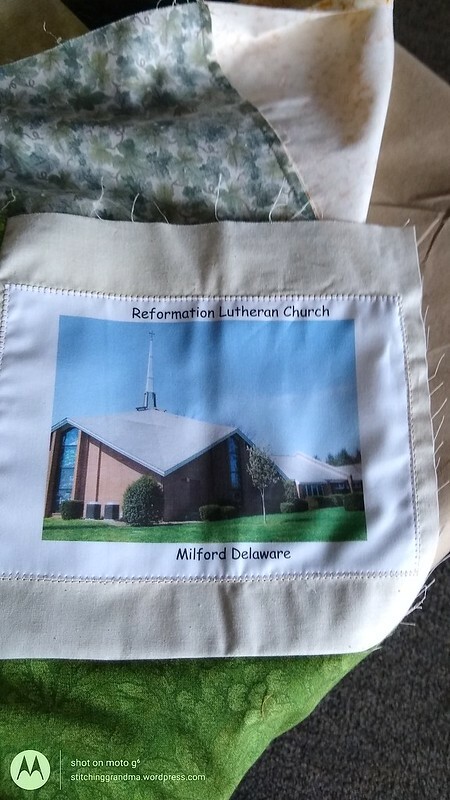 The quilt will be out in the Narthex of the church (Reformation Lutheran Church Milford ) for several Sunday mornings. Congregation members will have an opportunity to sign the quilt and offer messages of inspiration and hope for the future. Towards the end of April several of us will gather together and layer the quilt and tie it. Presentation is scheduled for Mother’s Day. This is the 11th year I have been involved with Senior Quilts. I owe the origins of my quilting life to this project, and blame my husband for elbowing me in church telling me “You can do THAT, it’s just straight stitches”. I also hold Pastor John, now retired, responsible for my quilting life! I’ve been the coordinator of the project off & on for 10 years. I took a 2 year break and let another quilter lead the charge when I was “stressed out” by too many years of too many grads. Some years we have had as many as 15 graduates. The last couple of years the numbers have dwindled. The future years there is an upswing in numbers of youth attending church and the project will take a lot more time. Thankfully for me this was an easy year. I can’t bring myself to get rid of all these containers of buttons that are donated to the quilt guild. Shoe boxes, metal tins, ziplock bags, all full of buttons. Hundreds and hundreds! I am guessing I have over 20,000 buttons around, waiting for someone to love them! They are HARD TO SELL at the meetings, because everyone seems to have a bin “just like it” at home. I’ve had “notion” sales at the guild meeting and the buttons sell here and there, but not a lot at a time. 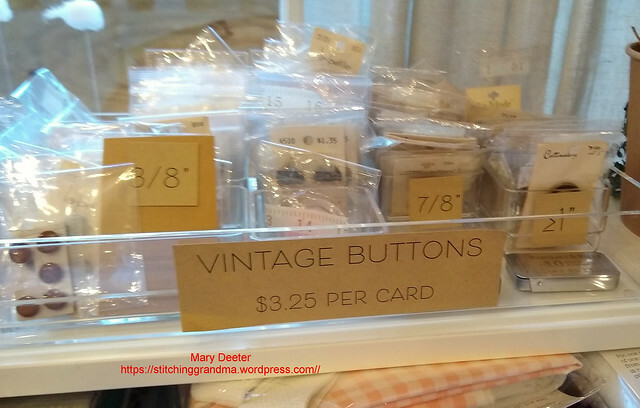 I was in Old Town Alexandria Virginia in January and saw “VINTAGE BUTTONS” for sale. There were many on cards, and I thought hmmm…..maybe I am underpricing my carded buttons. I can’t give them away for 50 cents for 6 buttons or 10 cents for 3 buttons. Maybe I should RAISE the price…..
I’ve sorted and bagged matching buttons. I’ve got 4 cupcake tins full of sorted buttons right now to bag up. Talk about labor intensive. The more I sort, the more I love the buttons! Should I raise the price and rebrand them as “vintage”. Surely they are! The metal buttons are my favorite! My 2nd Time Around Co-chair and I have been pondering the question! How to get people excited about buttons and ways to use them, beyond your typical garment sewing. How to sell them? We are getting ready for the Ocean Waves Quilt Guild Show on April 26 & April 27, 2019. My 2nd Time Around committee is going to have a huge booth with lots of fabric for sale. We are also going to SELL these buttons! But before they sell, we have to INSPIRE people to buy them! We’ve been looking at ideas for crafting with buttons on Pinterest – and I have a “few pins” – Button Fun! We made a few projects and I wrote about them here Feeling a little crafty and here Fun with buttons and More! Carole at From My Carolina Home has a great blog post today called Buttonmania Strikes Again !! Over the years she has posted some very clever projects using buttons. Oh, yes, she has a Pinterest board too and gives you “fair warning” about going down that rabbit hole! (I have to set a 20 minute timer when I start on Pinterest). So, all that said, there is no lack of creative ways to USE these buttons! We have decided to sell the loose buttons at the show in a “fill a bag” manner. A big bin of buttons to look through and square snack bags to load up with your treasures for $1. We are going to display our “sewing room wreaths” to inspire others, and between now and then perhaps make a few more “button crafts”. The other fun thing we are going to do is make “wreath kits”. Quart size bag full of assorted threads and notions, buttons and lace so you can build your “own” wreath. We will make just a limited number and see if there is an interest. Do you have a button box? What do you save them for? Have you done any button crafting? Would you share your ideas? Don’t forget to hop over to Carole’s blog post and when you comment, tell her I sent you there! 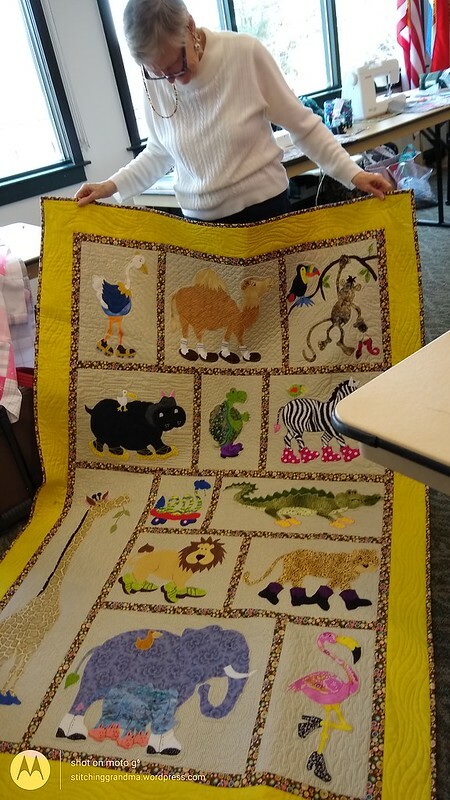 Throughout the process of making her quilt I shared pictures and talked about it on my blog. A look back at my blog archives in May through July of 2016 shares lots of conversation about her quilt. Feel free to search an look back! I finished her quilt and delivered it, only to borrow it back in 2017 for the Ocean Waves Quilt Guild Show. I was delighted to learn it had been awarded a 3rd place ribbon. My daughter brought Addison to see her quilt hanging at the show and that was an exciting time. The quilt went back home and into the closet on the shelf, to await the day when she was “big enough” for a bed to put it on. Last week the new mattress etc came home and her room was rearranged and the bed “dressed”. Mommy snapped a photo and said she just LOVED sitting on her bed with her quilt and new pillowcases. If you click on the photo it will take you to the album on Flickr where there are more photo’s of the quilt, including the back (which I think is the reason I got a ribbon). The quilt is really “two sided” with a pieced back using some of the excess blocks and fabric. My daughter wanted coral and grey, and I threw in the turquoise because so many of the coral pieces I found had the turquoise too. Turned out to be a good decision and added another dimension to her quilt. 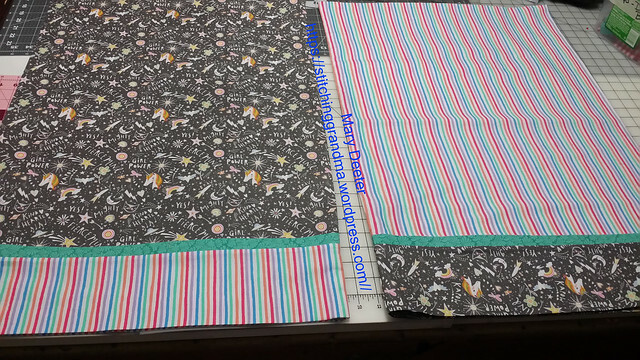 The fabric for the pillowcases came from Serendipity Quilt Shop last year, and was fun because it had the colors I wanted and the stripes to match up with the unicorns! 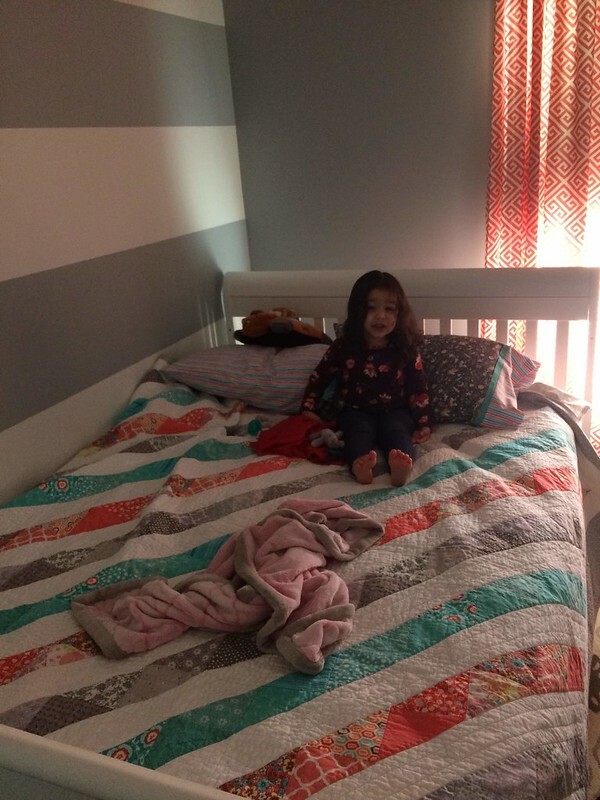 The purple and red in the stripe fabric added another layer of color in her gray and white and coral room. I think they go well enough with the quilt, and the unicorns are a favorite. What about you? Do you have a project you have made and given away that brings you JOY a year or more later?? Do tell…. Wow....what a journey I have been on blogging! This is my 500th post, and I wanted to share with you a little bit of the journey. First of all, WELCOME if you are a new reader. Secondly – THANK YOU to everyone who comes back to read my blog and chooses to follow. My blog was started not to long after I retired. My first post was Nov 28, 2012, Welcome to my blog . My daughter suggested the idea of a blog to me and said I might “have something to share”. I was familiar with a few blogs and often came across blog posts with instructions and directions when I was searching the internet for a method to do something. Here we are 6+ years later. My posts have been primarily a journal of my “Random acts of Quilting”. I’ve written about various projects over the years that I have done, along with crafting and sewing for the grandchildren. Occasionally I have posted about travel experiences. I hope to do a little more of that in the coming posts. I’ve share links to some of my favorite tips and techniques, bloggers whom I enjoy reading and their special projects, and encourage participation from others in making quilts for others following disasters. Comments – I LOVE reading your comments and responses to my blog post. I’ve appreciate hearing from you and will often ask a question at the end of my post to elicit your response. I do try to reply to your comments, tho sometimes I am slow! Blog changes – over the years, I have learned a little about blogging, posting photo’s and adding links, how to store my photos and how to embed them in the post from other platforms. I’ve had help from other bloggers when I wasn’t sure how to do something. My blog friend Carole (From My Carolina Home) and I emailed each other a lot when we both found ourselves running out of “free space” on the platform and how to better manage our photos. There have been opportunities to make changes that would “monetize” my blog, by having affiliate links and more advertising on the blog. I have chosen to not take that path. The timing wasn’t right for me and simply stated, I don’t want the pressure to post as frequently as monetizing would make me “do it”. Just today I learned about “hash tags” and how they work. For example – #lifecycleDE #youcanridewithus #bicyclesforall will take you to my favorite place in Milford and you can find Ben & Jenn and get help with your bicycle and encouragement to ride! (I always wondered what those # things were about and Jenn gave a lesson just this morning on posting in social media). Thanks Jenn. Frequency – I feel like my frequency drops off posting when I haven’t completed a project. This last year has been full of challenges for me in that regard. I continue to work in my sewing room, out over the garage. Sometimes I lack the motivation to get out there and “do something”. I believe that posting requires photo’s…and sometimes I just don’t take any! (Sometimes I take too many). Before I can hit the “publish” button today, I will have to get out to the garage and take a picture or 2! Watch for the detail near the end of the post! Favorite Posts – I really enjoyed writing about the block of the week project I did in 2017 with blocks by Pat Sloan. The project was called Grandma’s Kitchen. It is the LAST quilt I finished, and my favorite. I wrote about that project from mid summer in 2017 until I finally quilted it in the spring of 2018. I have to say it has been slept under in my guest room and is the first bed quilt I have kept. It has a hanging sleeve and yet I failed to enter it in our upcoming quilt show. Maybe because Grandma’s Kitchen STILL needs a label and my long arm quilting efforts are not “show worthy”. Web Searches – My posts pop up often when someone searches for a particular subject. The 2 topics that I find being searched regularly are Log Cabin Cross and Vintage Sewing Machines. I have made several of the Log Cabin Cross projects and here is a link to one I did a few years ago – Banner Completed . Another post that has been visited repeatedly was written in the fall of 2013. Old and New Sewing Machines has had a lot of activity. I think it is time for an update to that post and might take on that task in the near future. My machine count has changed and some of those old ones are just hanging around taking up space. I haven’t even told you about (or USED IT YET) my latest acquisition! If you are a blog writer, be sure to use the TAGS feature. That is what helps in searching. The future – Regulars know that I am recovering from hand surgery and believe it or not I have learned to type on my computer keyboard without using the splinted keyboard. that letter K along with the I and the period are still challenging me, but I am learning to type again without using the long finger on the right hand. Hoping when the splint comes off that I can resume “normal ops” with the keyboard! PROJECTS – So many and sew much fun. I have decided to make an effort to get some things finished. Oh the UFO’s are too many to list. On my sewing machine table right now are placemats with binding begging to be finished. They are not the OLDEST UFO by any means, but they are achievable. I’ve gotten the binding on 4 of them. One daughter said she would like 6 of them, so I am motivated to proceed. I cut blocks yesterday for the ONE Senior Quilt I need for church this spring. (Yes, I can cut with the splint on). My friend Nancy is picking up one yard of a particular fabric for that quilt for me. 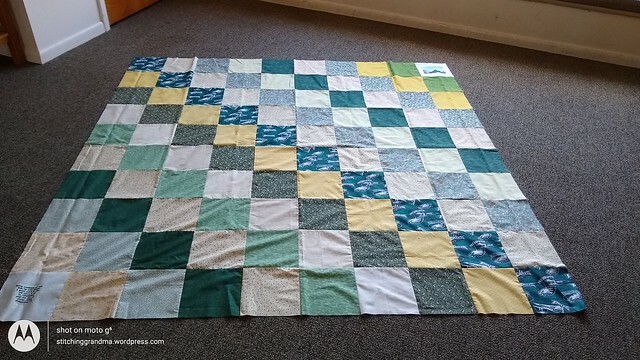 I still need to cut some muslin blocks for the church members to sign, and get the verse embroidered and the photo printed on the fabric for the quilt. Since this quilt has a deadline I need to get busy. Our Ocean Waves Quilt Guild Quilt Show is coming up on April 26 & April 27, 2019. (Check out the link to the show). Because of the show, I am working had scheduling helpers and getting fabric ready to sell at our Second Time Around booth. I have workshops set up for once a week between now and the show. MOTTO – When I worked we had a mission statement. My MOTTO is in place of the mission statement. My motto is TRY TO HAVE FUN EVERY DAY! 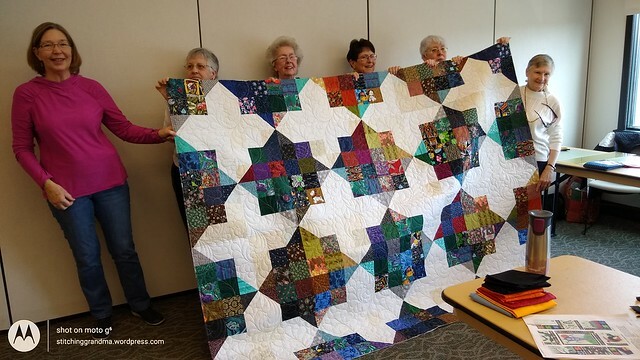 I am having fun with my blog, my quilting, my sewing for grandchildren, hanging out with my friends I’ve made at the quilt guild, and travel. I even (gasp) have fun working Second Time Around ! 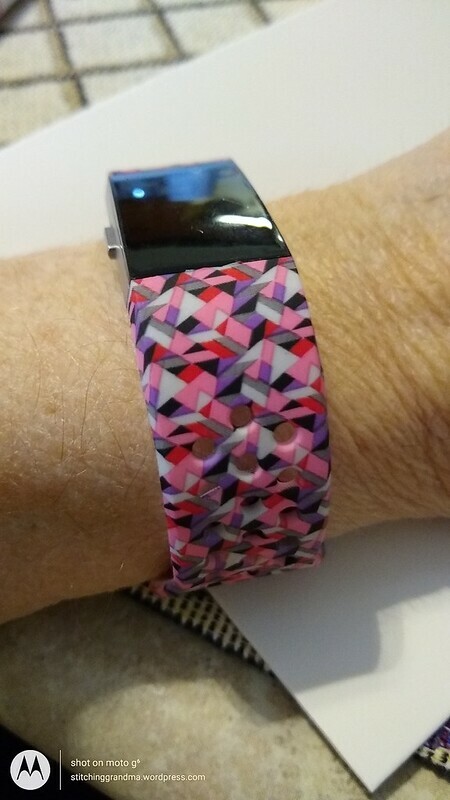 Last eye candy — went shopping online and picked out a new fit bit band….selected it because it reminded me of quilts!!! The best eye candy of the day was a photo I got this morning of my “soon to be 3” granddaughter. She just moved up into a “BIG” bed from her toddler bed, and her QUILT and pillowcases were on the bed that I made. That eye candy will have to wait for another day. Just know that it was a joy to see her enjoying the quilt I made for her 2 + years ago !